There are two ways of figuring out balance owing to CRA for Source Deductions. In this tutorial I will show you how to look up, record and pay this amount to CRA. First you need to know how much to pay. 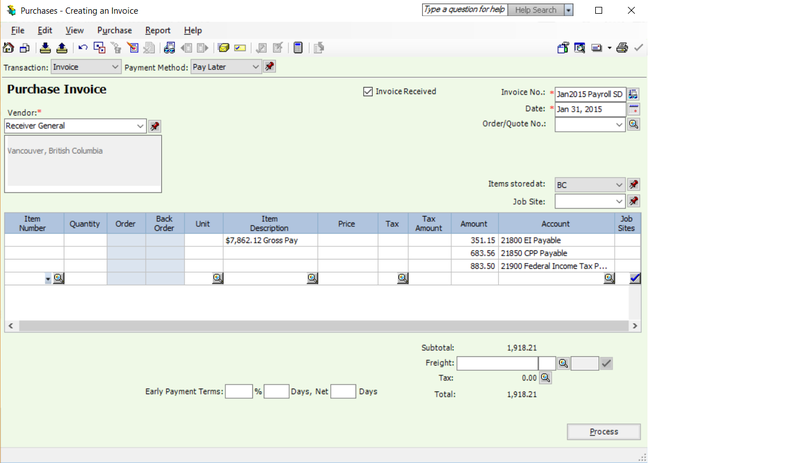 Go to Reports, Financials, Transactions by Account or General Ledger (depending on the version of Sage 50 you have). Choose the date that you need to remit source deductions for. Mine is January 1 – 31, 2015. and the balance is due by February 15, 2015. I have highlighted the 3 accounts I need and the report will sort by Date. I exported my report to Excel just so I can shrink it for this tutorial. Yours will look a bit different being printed directly out of Sage 50 program. Now we know how much to pay. these amounts include both employee and employer portion. No other calculation is required. 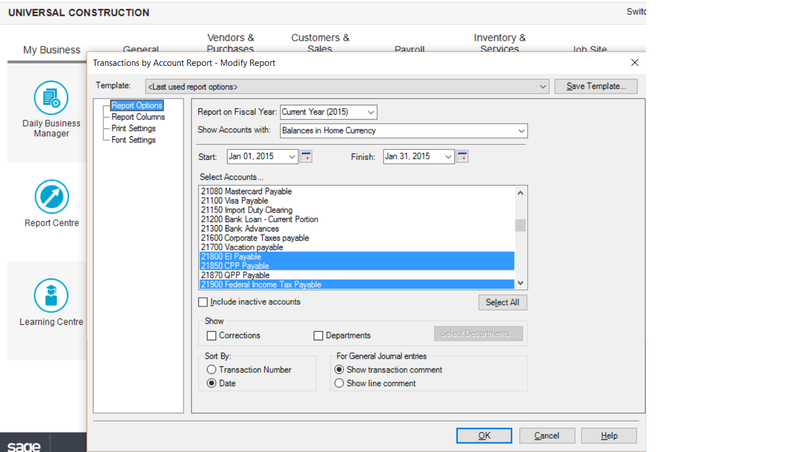 Open purchases journal and pull up Receiver General or what ever Vendor name you have for CRA. 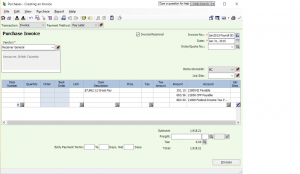 Invoice no = I have my own invoice # (Jan2015 Payroll SD) SD is for Source Deductions. you can adopt any system you like. Date = the pay period ending date which for me is Jan 31, 2015.
and in the body of the invoice I have recorded the amounts owing and posted them to the appropriate liability account. the balance to be paid is $1,918.21. According to CRA this amount is due by February 15, 2015. So on that date I will go to payments and generate a chq for this amount. I can mail it to CRA or pay it at the bank. Note: if you are mailing it to CRA generate the chq earlier to give time for mail. You can follow the same steps for GST / HST. If you have specific questions I be glad to help. Send me a note in the questions area. There is a step missing in this tutorial. Where are the employers contributions? You need to calculate the total source not just the employee portion. Using your numbers, below are the calculations that should be used. Sage has already calculated the EI at 1.4% and has already doubled CPP. The report shows the grand total to be paid to CRA. EI $31.15 and CPP 683.56 include both employer and employee portion. Every time payroll is ran the system automatically calculated the total employee and employer amounts and posts them to the liability accounts. I think this maybe a bit misleading to a beginner because GST is a somewhat different process in that you are using income and expense accounts in the GST calculations, and filtering out GST. There are also carry forward amounts in the report that may need to be considered in the calculations. I find your tutorials extremely helpful and great refreshers for someone who knows the process but a beginner may not be able to follow along as easily. Thanks for all your work in posting these tutorials, I hope I did not offend you in anyway I am trying to be helpful.